I recently learned that Marginalia to Stone Bird is the first poetry book to be nominated for the Crawford Award. I am really honored. Two of my poems, “The Ash Manifesto” (Strange Horizons) and “The Journeymaker to Keddar II” (Marginalia to Stone Bird) were nominated for the Rhysling Award. I am traveling back home from a conference and feeling really unwell physically. Hope to post more soon. I learned today that my debut poetry collection Marginalia to Stone Bird was a finalist for the William L. Crawford Award for a first fantasy book. I am really honored. ETA: I learned that Marginalia is the first poetry book to be nominated for the Crawford in the history of the award. Charlie Jane Anders’ All the Birds in the Sky was the winner this year. 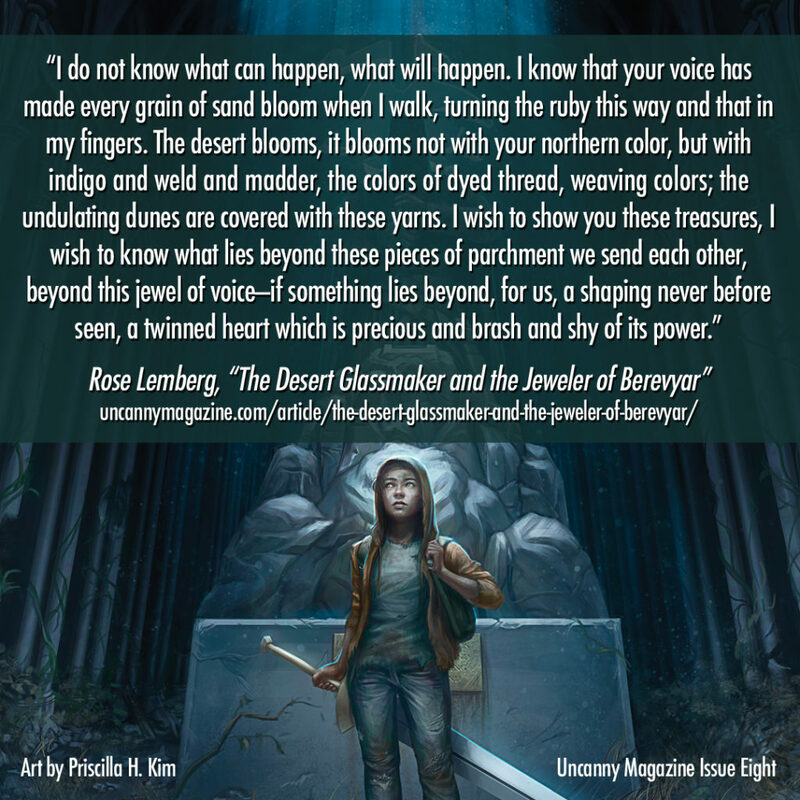 Uncanny Magazine made this beautiful story tile for my Birdverse short story from the January/February 2016 issue, “The Desert Glassmaker and the Jeweler of Berevyar“. I just love this. This story is eligible for Nebula, Hugo, and World Fantasy in the short story category. I am promoting Likhain/M.Sereno for the Hugos, specifically for Fan Artist Hugo. I am also voting for her in the Professional Artist Hugo category. WHO: Likhain, aka M. Sereno, a queer Filipina immigrant artist currently living in Australia, artist and poet. WHAT: Fan Artist Hugo; also eligible for Professional Artist Hugo (justification below). WHY: Likhain’s exuberant, non-Western, joyous, detailed art is an inspiration to many of us and should be more widely recognized. (Website); Portfolio). I was so happy when Mia/Likhain received the Tiptree Fellowship this year. 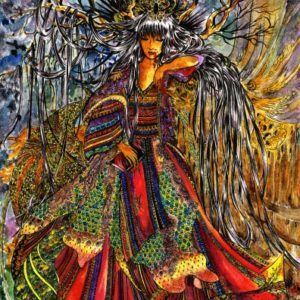 M.Sereno/Likhain is a marginalized artist of color whose work often slips through the cracks in the world of ‘accepted’ SFF art styles. This is where my work arises: the point where women and monsters wear the same face, where we must be feared not because we are destroyers but because we are too strong to be controlled. In my art I take the destructive portrayals of the mangkukulam, the entrail-eating manananggal, the shape-shifting aswang — and I paint over them with gold and glory. In my art I show women who are unapologetic in their power and unashamed of their monstrous limbs, their scales and sharp teeth. 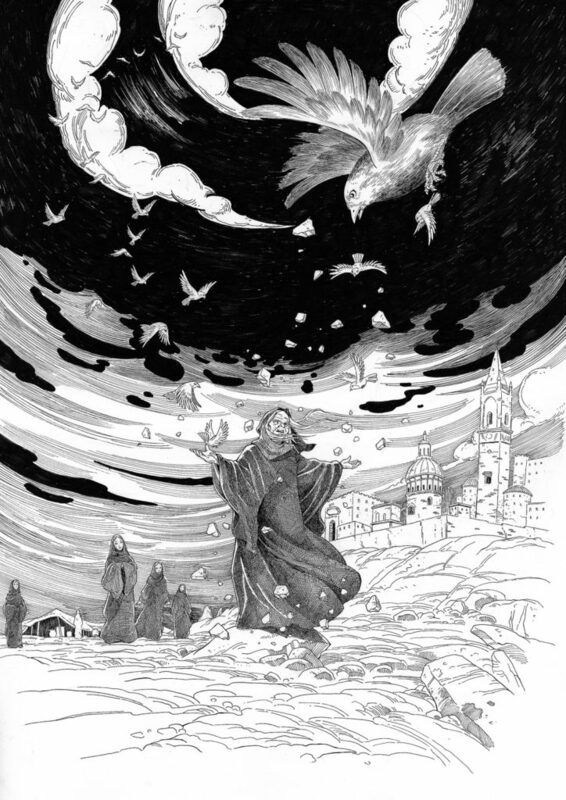 Last year, Likhain was on the Hugo Longlist in the Fan Artist category and came very close to being on the ballot. Many of us believe she would have been on it if not for the P*ies (File770 detailed analysis of the ballot). How can we help bring Likhain/M.Sereno award recognition this year? No confusion about names. Please vote Likhain; please join me in letting the Hugo committee know that Likhain, M. Sereno, Mia S./Sereno are the same person and these votes should be tallied together, so all permutations would count. No split/divided votes. If you only vote for her in one category, please vote in the category where Likhain already came close: Fan Artist Hugo. Last year, I watched the negative impact of split votes for multiple people. If we want to see a person on the ballot, showing in one category tends to be stronger. 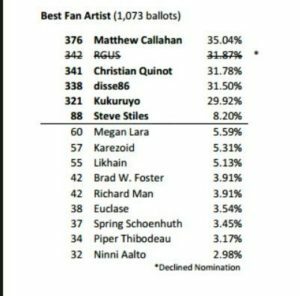 IF you vote in two categories, vote BOTH Fan Artist Hugo and Professional Artist Hugo. Likhain is eligible in both categories and I am voting for her in both categories. SPREAD THE WORD. Twitter, Facebook, blogs, chats, whatever works. Sigasig, by M.Sereno/Likhain; appeared on the cover of Lackington’s Magazine. But Mia’s art is professional! Yes. Yes, it is. Yes, yes, yes it is. Wonderful artists often migrate from Fan to Pro in the Hugo category, and my hope is that if Mia/Likhain gets recognized in a Hugo Category (remember, she came close in Fan Artist category), then it would be easier for her to get professional engagements and help her be recognized in the Pro category in a year or two. I heard of cases where her portfolio was rejected because it was not “professional.” This is not because Mia/Likhain’s art is not “professional” but because it is non-Western and does not fit neatly with some venues’ concept of what is professional art. We need to raise awareness about that. Award nominations are a great way to raise awareness of a marginalized artist’s importance in a community. We can do this. Let’s do this. My Birdverse novelette “The Book of How to Live” has been getting attention from readers and reviewers, for which I am very grateful. “Book…” is on the Tangent Recommended Reading list – two stars. Fran Wilde posted “Things to Read While Rebooting: An awards Post of Sorts” in which she recommends “The Book of How to Live” in the Novelette category. “The Book of How to Live” by Rose Lemberg, out from Beneath Ceaseless Skies. This story, maybe more than any other this year, has been important for keeping going. For finding ways to make the work worth doing. Focusing on what’s important. Pushing forward. Charles Payseur also discussed this story at length on Cabbages and Kings. While looking around for reviews I keep running into new reviews of my Birdverse novelette “Geometries of Belonging.” This story was overshadowed by “Cloth…” last year, but people keep finding it. It’s a story that keeps on resurfacing. Here’s a review from JC Hoskins; their blog is Strangely Charmless. Thank you. Parét is a healer who works their craft by using deepnames, the Birdverse magic system. In the course of their work, they meet a young neurodivergent, trans person: Dedéi. And, while Dedéi’s situation cries out for help, they are also close to the heart of a dangerous political problem that could bring down Parét’s lord and lover as well as drag the nation into war. Dealing explicitly with emotional and physical abuse and the sickness that always lies behind it, this story also talks about the trouble with attempting to do good in the world—i.e. the harm that is often inadvertently caused. As a result of loss, Parét has sworn to move through the world without affecting it, for good or ill. But their drive to heal often lures them into action against their better judgement. I won’t give away the ending, but I will say that you shouldn’t be afraid to read this: there is no tragedy here for you. Instead, this is a story for survival, for resistance, for overcoming. This story is what you need right now. “Going at my own pace: The Impact of Rose Lemberg’s “Geometries of Belonging” is a beautiful and needed essay by Xan West about how “Geometries…” influenced their writing on disability. I cannot explain how deeply affirming my reading experience of Geometries has been. The pacing alone…the way this story moves just flat out works for me. It begins slowly, builds in spirals. When I am in it, I am fully immersed and held, supported. I get to attend to the things that are important to Parét, follow the way he thinks, connect with how he feels, and this gets to be so much deeper because I am not using such a big part of my brain trying to match pace with the story. I found myself breathing slow and even as I read, almost like I was meditating. It was as soothing as letting myself stim feels. Many of my stories are in Xan’s End of Year Book Survey 2016 with some very kind words about my work. Thank you very much. My novel The Upholding features Parét twenty years before the events of “Geometries…”, so if you appreciated “Geometries…”, this book might be for you. 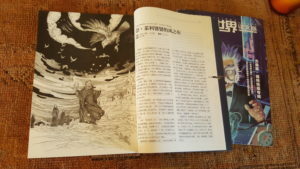 I have mentioned before that I have been very fortunate to work with Renne Chon of Science Fiction World, to get my Nebula-nominated novelette “Grandmother-nai-Leylit’s Cloth of Winds” translated into Chinese. I have posted some translation Q & A with Renne Chon on my Patreon as a rare public entry. In November, I received two issues of Science Fiction World with my story, gloriously illustrated by Chengxing Huang (黄诚兴). Science Fiction Magazine (China) was the original commisioner. I sent a photograph of the spread to my parents in Israel. I have a difficult relationship with my parents around my queerness, but they were very excited that a story of mine was translated into Chinese. My father, a painter and sculptor, loved the illustration. My dad had a stroke and passed away suddenly in early December. This translation and illustration were the last thing of mine that he had seen. It means more to me than I can express. Thank you, Science Fiction World. The end of 2016 has been so horrible for me that I’ve been sitting on this bit of good news for a while. At long last, here it is. My querying process for my Birdverse novel THE UPHOLDING was surprisingly short and eventful; I sent out a dozen queries and received three offers of representation and a rewrite request from four wonderful agents in the field. I loved the conversations I had with these agents; I feel that I learned a lot about the business, and also about myself and my work. I am very grateful for the time and attention my work has received from the agents who considered it. I had to make some difficult decisions, but I am very happy to announce that at the end of this process I have signed with Connor Goldsmith of Fuse Literary. I had many excellent conversations with Connor and am looking forward to working with him. This is my customary award eligibility post for the year. I did not have as much short pieces out because I was concentrating on longer work, but I am very proud of what I did publish this year. I have bolded pieces I feel are most deserving of award consideration. Short fiction nominating folks, if you only want to read one thing, please read “The Book of How to Live” (novelette) in BCS Magazine. Short Story:“The Desert Glassmaker and the Jeweler of Berevyar” (Birdverse short story), Uncanny. Novelette: “The Book of How to Live,” Beneath Ceaseless Skies (Birdverse novelette). Best editor, short form – for An Alphabet of Embers – eligible for the Hugo. We are always happy to provide review copies of AoE! SFPA voters – if you’d like a copy of Marginalia or a file with poems original to Marginalia, please comment or contact me, and I will send it to you. Thank you very much for considering my work. Bracing. Spicy. Lightly bitter. It’s how I would profile a Session IPA, a drink that speaks to me of autumn and the smell of burning leaves. 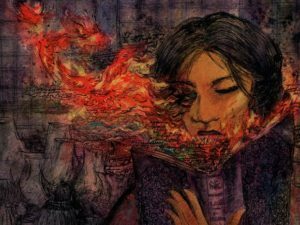 It’s also how I imagine “The Book of How to Live” by Rose Lemberg would taste, with an eye toward resistance and revolution and city teaming with magic, cultures, and history slowly coming to a boil. And that might seem a bit dramatic for a story that is, at the surface, about lanterns and machine lubricants water pumps. And yet the story does a magnificent job of looking at the economics of magic with a careful eye on where the magicless resident in a society that so strongly values magical talent. Read the whole review at Nerds of a Feather. This story is about community, revolution, and resistance, and it just feels very timely right now. Friends, this has been a difficult week. Devastating for many of us. I have spoken at length on twitter about my feelings about this election, and will continue to do so there: @roselemberg. I posted on Twitter last night that I am reluctant to announce the sale of my novella — it feels weird to have good news at such a difficult time. Many people told me that good news would be welcome. With this in mind: I have sold my Birdverse Origin novella, “A Portrait of the Desert in Personages of Power,” to Beneath Ceaseless Skies. It is an intensely lyrical and mythic piece with power exchange, consent, trauma, survivorship, queer/trans romance and people turning into giant flaming birds. This piece is very important to me and I hope you enjoy it too. It will be published in Spring 2017.